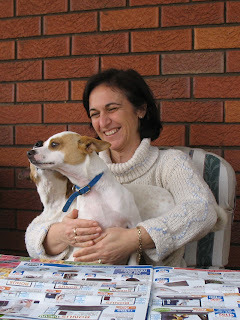 Joanne with Kaye's two dogs, who are so spoilt. They are lucky, lucky dogs to live here! They got so much attention and extra food this weekend that we've quite ruined them for normal life. It's Wimbledon time, and I stayed up late watching Lleyton Hewitt get beaten by Roger Federer; never mind, I still enjoy the tennis, even when the Australians don't win. We did our Teacher Training class yesterday, learnt lots of things about the new Statler software and how to train others to use it. It will be great fun to get home and try everything out. Meredith will want to take the belts off and record her freehand feathers as stitching files, and I want to try trimming cross-hatching around applique. We might be fighting over the machine in the next few weeks. 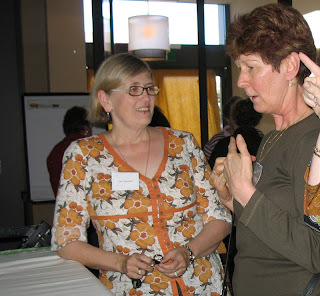 Our teacher was Kim Diamond, and she was excellent; very knowledgable and made the day great fun. It was amazing how the mood of the class changed when she informed us that we had to get up and present a section to the rest of the class. That took the wind out of our sails real quick; no-one wanted to have to get up and play 'teacher', even though the 8 of us are old, old friends. But it went OK after we relaxed and had a few jokes with each other. Unfortunately blogger won't let me load any photos, so I will just sign off and come back later when I can put in some photos. I'm settled in at Kaye's after a nightmare day of travelling on Thursday. The airport at Sydney was experiencing such high winds that only one runway was operating, and rather than have planes circling waiting to land in such bad conditions the Sydney bound planes were given a strict time slot to take off. Which meant huge delays and cancellations all through the day. I ended up being re-routed through Melbourne, with three cancelled Sydney flights; I think I'm lucky to have got here at all. And it's not nice to be warned that there will be extreme turbulence on landing; they always say calming things like 'minor turbulence, some disturbance' to put your mind at rest, but not this time. As luck would have it, we landed without even a twitch, for which I was mightly thankful. With perfect timing I walked straight onto my connecting train, and was soon in bed snuggled up with MY quilt. 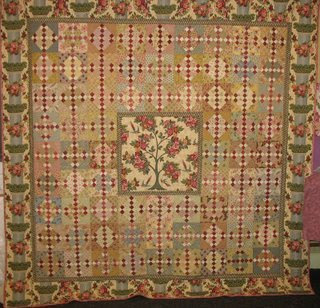 There are always new quilts to admire at Kaye's; this is her copy of an antique quilt, Remember Me, and it won a judges commendation at the Sydney show this year. 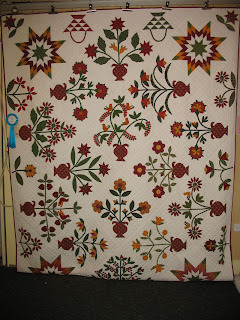 She does such a wonderful job on her quilts, and has a great collection. This workshop is Quilt Heaven! Everyone has gone off to the Rydges hotel for the conference, so it's peaceful and quiet and I'm enjoying the solitude. Once I get my work done I'll have a look around and see what's new in the antique quilt cupboard; I wish I had as many as this. 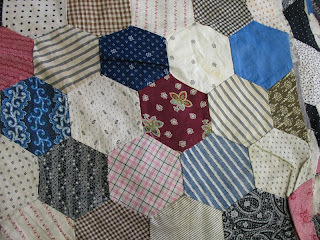 And I did see a hexagon top that I fancied; I would hand quilt this and get to know each fabric. There are some delicious double pinks and mourning greys. I adore this sort of 'farm' quilt, made for utilitarian use. If I had lived in those times I'm sure I wouldn't have been swanning around Baltimore in a hoop skirt; more like barefoot on the prairie. Which is how I would want it. Winter is starting to set in, and the days have been quite chilly. Not that I mind, because it's perfect weather to rug up and do some handwork in a comfy chair. 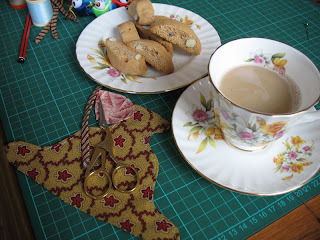 Afternoon tea, Italian biscotti, fine china, applique; it's been a pleasant weekend. I've never made a completely appliqued quilt, but I'm having fun with these blocks. Mereth and I are working on a quilt together, one of her original designs, so when it's a bit further along we'll show some pictures. 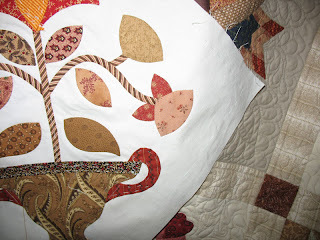 I have grandiose plans for applique borders and splendid blocks, but who knows how long my enthusiasm will last. Long enough, I hope. First thing in the morning I have been making 1" Half-Square Triangles, for another joint project that Mereth and I are working on. We need hundreds of these little critters, and I'm making them 80 at a time with my own paper templates. 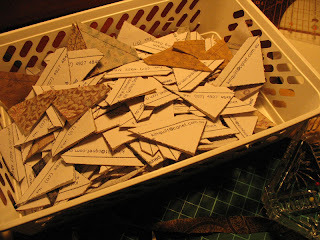 There's 320 in that container, and at Patchwork tomorrow I'll sit and take the paper off and press the seams. That will keep me busy for a while. Mereth has already completed a heap, and I had a play with her units today. The finished quilt won't be anything like this, but I may have to make a mini quilt on the side. I just love these tiny triangles. Matt and the dogs came in to visit, and Mac ran around my backyard in pursuit of his tennis ball. 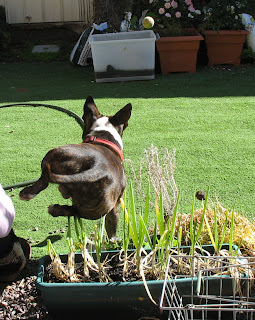 Nothing gets in his way when he's chasing it; I like the leg action as he clears the planter box. He's so single-minded, and never takes any care of himself; he must have banged his head into the garage door 10 times. His energy is astounding. 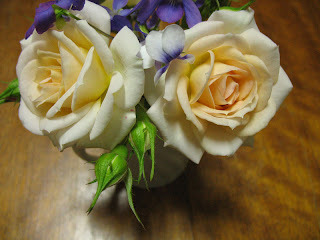 And lastly, miniature roses and violets brightening up the kitchen table. In between bouts of computer work I managed to sew another 8 of my Colour Sampler blocks. I had a few more cut out, but decided to leave it at this. 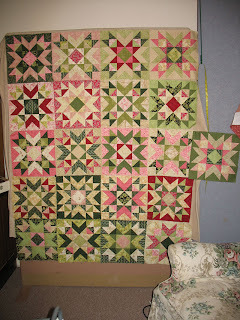 The quilt will be 4 blocks by 5, and I haven't decided yet whether to join them with sashing or just edge to edge. It would be hard to get all those seam intersections to behave, so I'm leaning towards a small cream strip to separate the blocks. I did enjoy making these, I just sit and stare at them trying to decide which is my favourite block. It doesn't quite count as a finished project, but it cleared up a project box and a wire basket full of fabric I had set aside for the blocks, so the sewing area is tidier. I think my ultimate goal is to have 10 machine projects and 10 hand projects, and keep it at that level. Any more than that is just too confusing. My list stands at 11 hand and 22 machine UFOs, so it's not unachievable; 6 of the machine ones just need borders. Time to get serious! 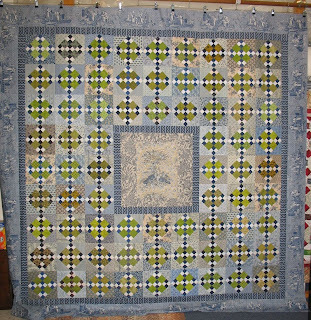 Last year I showed a picture of a quilt that my friend Kaye made. I adore this quilt so much that she always puts it on my bed when I go to stay with her. I was always going to create my own version of it, and started some blocks last year. Somehow they never really inspired me, wrong materials and colours, but now I seem to have recreated it all in blues and greens. No matter, I will just start another set in the colours and fabrics of Kaye's quilt. I love this block so much, I'm still not sick of it after making 85 of them. I only needed 72 for this quilt but, being me, I ended up with spares. I just can't seem to make the right number of blocks, ever. 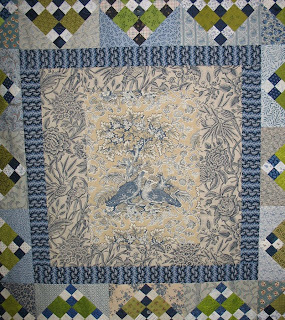 The centre fabric with the pheasants was a Fons and Porter print that I only had a FQ of; I surrounded it with a bird print and I love how that turned out. The border is a toile that has been in the stash for many years, and I chopped up most of it, fussy cutting the strips so that the joins were not noticeable. It didn't suit being cut lengthwise, I would have had to cut through faces and babies and puppies, and for some reason that troubles me. But I'm really happy with the results, it was worth the extra effort. 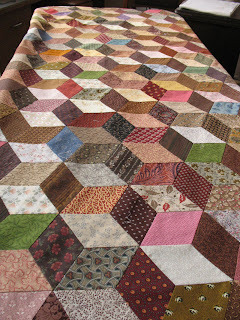 I need another hand piecing project now that I've finished the Tumbling Blocks quilt. This one seems to be an obvious choice; I have about 1/4 of it pieced, a lot of shapes cut out and it will go together quickly as the pieces are large. 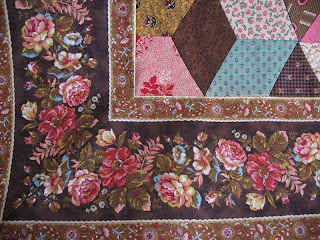 The original quilt was published in a Ladies Circle Patchwork Magazine in 1990, and I set about making a copy, even though reproduction fabrics were almost non-existent then. I'm actually quite glad I put it aside, because now I have the perfect 1800s prints to finish it. This charm pack of the Charleston IV range is going to find it's way in there somewhere. The template only just fits. I taught at a quilt conference with Tina Gravatt years ago, and one afternoon after classes about 10 of us sat on the floor around Tina while she showed us her stack of beautiful miniature quilts. One of them was an elongated hexagon, inspired by the same photo in the magazine that had made me start my full-size version. 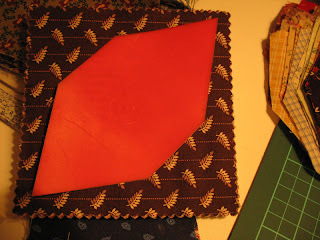 I love mini quilts, and one of the major advantages is that they are much quicker to finish. Tina certainly didn't waste time completeing her version, and I'm still working on mine 18 years after I started it. 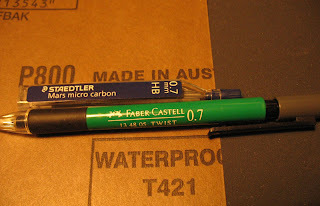 When I mark my templates I use a mechanical pencil with a thick .7mm lead. I also use carbon leads in it, instead of the more common polymer leads. The carbon marks more easily and washes out better, and the thicker refills make them more robust. I use a sheet of Wet'n'Dry black sandpaper under the fabric to stop it from sliding around, and the pencil marks the fabric more easily. It's extremely fine, and is much gentler on the fabric than regular sandpaper. 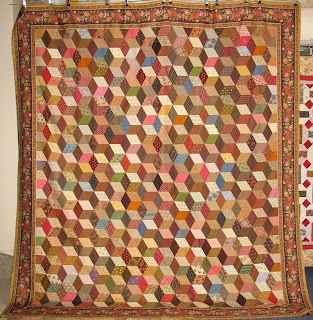 The Tumbling Blocks quilt was made with a 60 degree diamond that measures 3" along each side. That's quite a large shape, I've made my other ones with a 2" diamond, which made them rather cute. I like the bigger shape because it shows off the pretty materials. 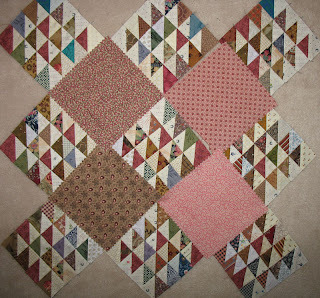 This is a photo of the Tumbling Blocks I made for Mum, with an apron made by my great-grandmother. 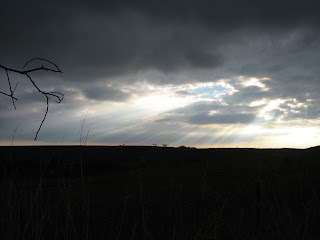 I pinched the photo from Mereth's blog, from way back in May 06. I'm too lazy to go round her place and take a more recent photo. I don't use a pattern for these quilts, as it's just the one template shape throughout. All you need is a picture of a Tumbling Blocks quilt that you like, and a 60 degree diamond template, and you're all set. All you have to remember is to join the light, mediukm and dark value pieces together in the same orientation throughout the whole quilt. The borders are on and the Tumbling Blocks top is finished, after 8 years. 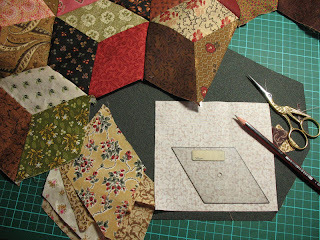 I love hand piecing this pattern, it's so easy and effective, and portable. I will probably start another one soon, ready for when I have to go on my next teaching trip. It's wonderful to have a project to take with me, that requires so little thought or effort. My other quilts in this pattern have been given away, but this one is mine. There are 8 years of memories stitched into this, and some of my favourite fabrics ever. I was careful to include some of my most recent purchases, like that red Judie Rothermel print in the corner; now it contains fabrics from the oldest to the newest. 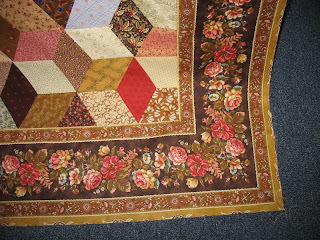 This border print is really perfect, but I used up every scrap; now I wish I'd bought another 3 metres for the stash. I'm sure there's another UFO it would be perfect for as well. Can't have two quilts with the same border though, so I'll have to keep looking for another border stripe. We shifted a lot of furniture around last week, including moving all my quilt storage shelves into the workroom, so that I could have a spare bedroom again. 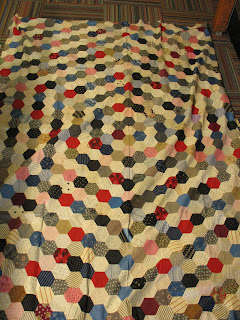 We refolded all the quilts as we shifted them, and stacked them neatly in their new home. 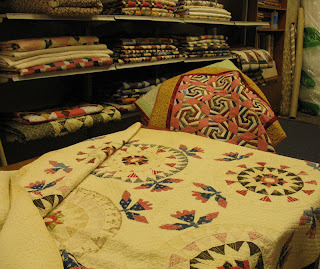 It all looks really good, and the quilts are easy to get to when we need them. Plus there's room to store three rolls of batting on top of the shelves, which gets them out of the way nicely. 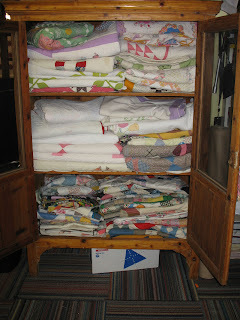 The photo shows some of the 65 quilts we have, including 8 antique ones I've acquired over the years. 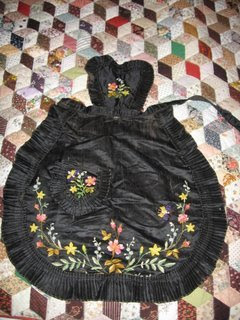 The applique on the table is one of my favourites, very faded but beautifully stitched, quilted every 1/2", and the fabric is so soft and heavy. We plan to replicate it some time this year, which will be a fun joint project for us. Patchwork group tomorrow, and I need to dig out another UFO to work on. I've been so good this year, finishing UFOs, I'm sure I've set some sort of record. 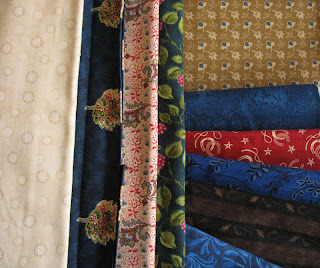 It kind of makes up for all the extra fabric I've bought, ready for those new quilts I'm going to start one day soon. 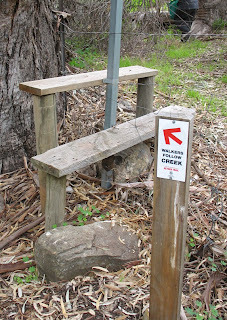 We have been planning to walk a section of the Heysen Trail for months, but the weather was so hot that it wouldn't have been wise. Finally we had a spare day and decent conditions, and arranged things with nephew Matt as our guide. The beginning of the walk is at Bowman's Park, where he lives, and he has walked these hills many times. 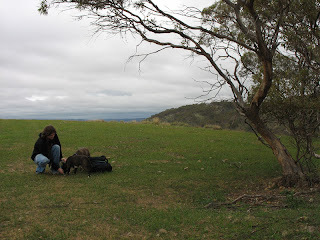 Matt and I with the three dogs detoured up to the top of one ridge for a better view of the surrounding countryside. It was glorious up there, a brisk wind and a fantastic view of the valley. 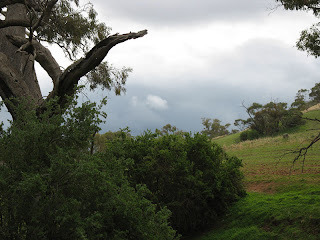 The creek meanders along the junction of those folds, so it takes a while to cover any ground as the crow flies, but we weren't trying to get anywhere in particular, just out to explore a bit. 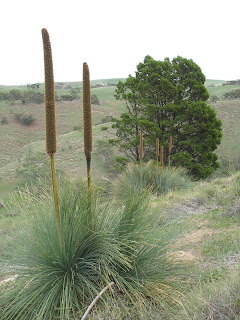 These grass trees were once called Blackboys, but now that's a bit politically incorrect, so they are Yuccas or grasstree. 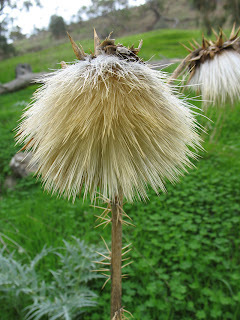 The tall flowering spikes set seed and dry out into woody spears. We used them as weapons when we went for picnics as kids; Mum just shook her head over us duelling with these things, and moaning about the wounds afterwards. I blame it on our brother, who always came up with the good ideas and walked away unscathed while we got into trouble. Matt on top of the ridge, giving the dogs a drink. Mereth had followed the creekbed, not wanting to go scrambling up hills, and she took this picture of us coming down the slope at the end. We are the two dots half way down; I had no idea we were so high up until I got to the bottom and looked back. It was pretty impressive. 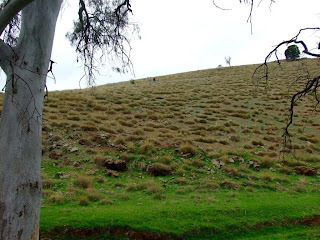 The grass on this hill is a form of Spinifex, with every blade ending in a hard spine. It hurts to touch, so we were coming down rather carefully, except for the dogs, who leapt down the slope like circus animals. They are all energy and no sense when they get out in the country. 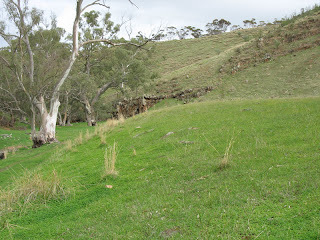 The sides of the valley are weathered rock, some areas with horizontal ledges. 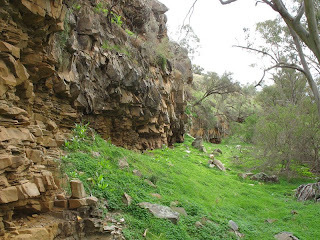 We surprised a fox who was camping on one of these ledges, and watched him run along the cliff face until he could scramble up and disappear up the hill. I can't like foxes, even though they can look beautiful; they are an introduced species here. Even though it's winter there is no water in the creek, which should be running and bubbling along with 12" of water in it. 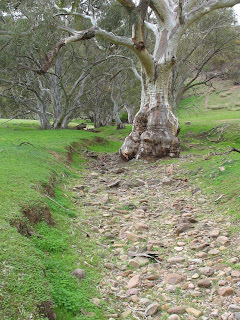 Our weather patterns have changed so much in the 40 years since I was a child; back then we had permanent water in rivers, and every autumn we got regular rain that made all these little creeks come to life again. The big trees look shattered and battered and ill. I should stop comparing it to the country I knew back then, but I feel so sad for this area, which is really showing the stress of climate change. But it certainly looked like rain that day. 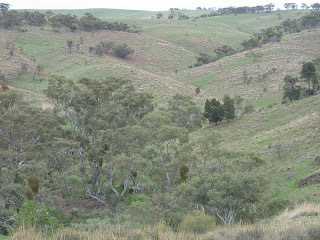 We left Mereth sketching by the creek and took off to try and reach an orchard that Matt had found on a previous trip. 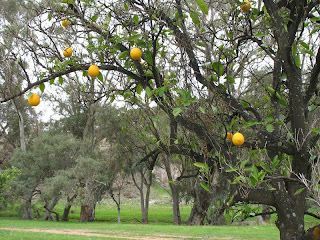 It's the strangest thing, 40 or so orange trees planted in rows in the middle of nowhere. Who on earth thought this was a good idea, and how have they survived? After last summer they should all be dead, but about 2/3 of them were sprouting leaves and several actually had fruit. I picked one and we ate it later, and although it was really dry it was sweet and tasted just like it should. Amazing. On the way home the rain started, and Matt took pity on Jessie and carried her inside his coat, with just her head sticking out the top. If it hadn't been raining I would have taken a photo, Jessie looked so smug and superior as the other dogs got wetter and colder. It pays to be little and only weight 4 kilos. It's been a week of travel and chores and furniture shifting, and now there's only one day left. I can't believe how quickly the time goes. and I don't seem to get a lot achieved. I'm sure the answer is to get up earlier, work longer and not go near the computer. 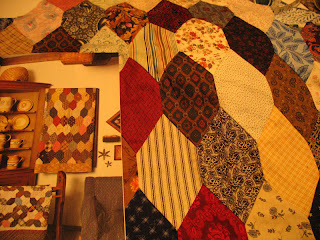 I have been determined to finish this tumbling blocks quilt, started in 2000. Several times I thought it was done, but decided I would like it wider, and longer and bigger and.... Enough! I made one final row of blocks, which necessitated finding my gear that I use for marking pieces for hand piecing. I had to collect it from places all over the house, which motivated me to set up an area just for handwork. Now I don't have any excuse not to finish my hand pieced projects. The top is now finished except for the borders, which I will put on tomorrow. It took me three hours to press all those seams; I was under the impression that I had been pressing as I went along, but I hadn't. It seemed like I would never get to the end of it, and every time I pressed one bit some other seam would bend back the wrong way. AGGHH! I have made three Tumbling Block quilts, and I've done the same with each one, left the pressing till the end. You'd think I would learn. With the first one I watched a Doris Day movie while I ironed it (It Happened to Jane) and I still think of that movie when I see that quilt! 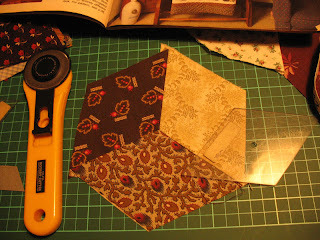 Interestingly I found the perfect border fabric for this only a month ago, so it seems it was a good thing I never finished piecingit earlier; it was just biding it's time till the right material came along. We went for a drive to another town on Tuesday, to deliver a quilt to a customer. 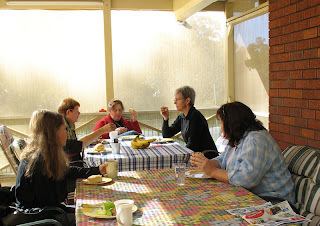 After we had accomplished that we had a little outing of our own, visiting a quilt shop, antique shops and a wool shop. I seem to have acquired a wool stash, and the sock wool is building up faster than I can knit it. 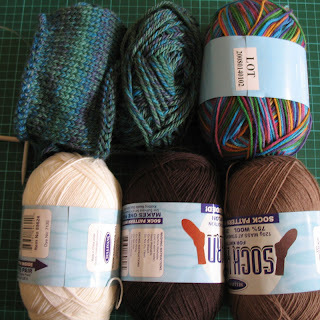 For the first time in years I'm knitting a garment, a casual cardigan coat, from the blue green wool at the left of the picture. It's knitting up quickly, probably a 12 ply, but there is anxiety when you knit clothing. All that work, and will it fit? Socks are pretty easy to knit, not a lot of thinking involved. I just hope the coat works out, because it is lovely wool. And there was a small amount of material buying; several pieces of that deep blue that I need a lot of, and some pieces that I just liked the look of. Someone had to give it a home. And my latest machine, one I didn't expect to get. It was on Ebay and I missed out on it, but the bidder who beat me reneged on the payment and I got it after all. Lucky Me! 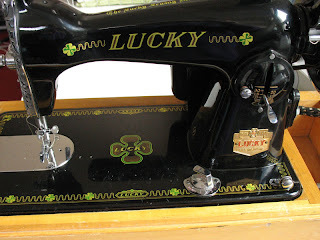 It's a dear machine, the decals are just lovely and the chrome on it sparkles. I think I can stop buying machines for a while, I'll just admire the ones I have. I also bought a pair of hiking boots that I'd been wanting for a long time, and there are photos to show tomorrow of our first hike; this post is long enough already.